Welcome to vegan burger month at My Goodness Kitchen. For reasons only the kitchen gods can tell you, I am inspired to create some truly delicious vegan burgers. Perhaps it was our recent trip to the Big Vegan Market in town where the smell of vegan burgers grilling wafted across the room. This week it’s a Crispy Quinoa Cauliflower Burger. 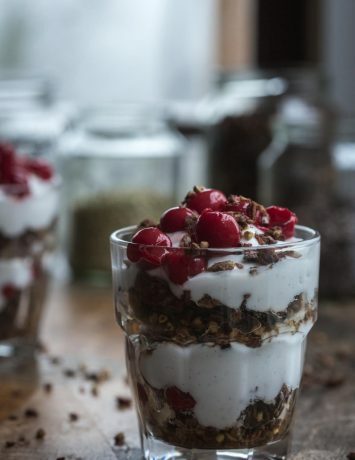 It’s simple, packed with protein and a little bit delicious. I am late for National Burger Day, I know. Admittedly, I seem to be late often these days and I am praying it’s a blip because I am usually annoyingly punctual. I am late for this blog post and the other day I was late for kindergarten pickup and found the Elf sitting on the big mat alone waiting for me. The kids sit on a mat together until the teacher releases them to their parents and she looked so tiny on that big, big mat. The mat was bigger that day, I swear it. Perhaps this vegan burger month is a little parental mea culpa. 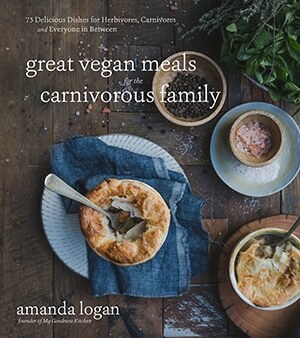 I have been super busy finishing up my cookbook and I know my small person loves the burgers….yeah, we’ll leave that little self analysis hanging in the ether, shall we? Let’s make burgers! 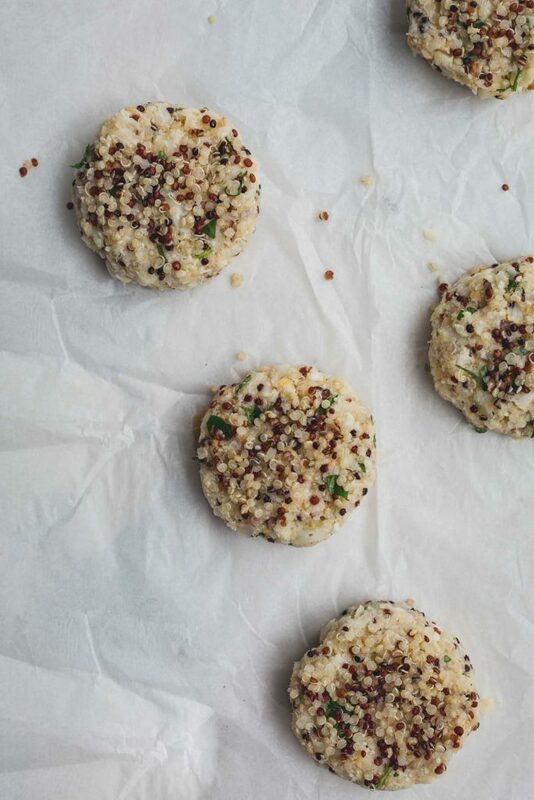 So, what’s in the Crispy Quinoa Cauliflower Burger? 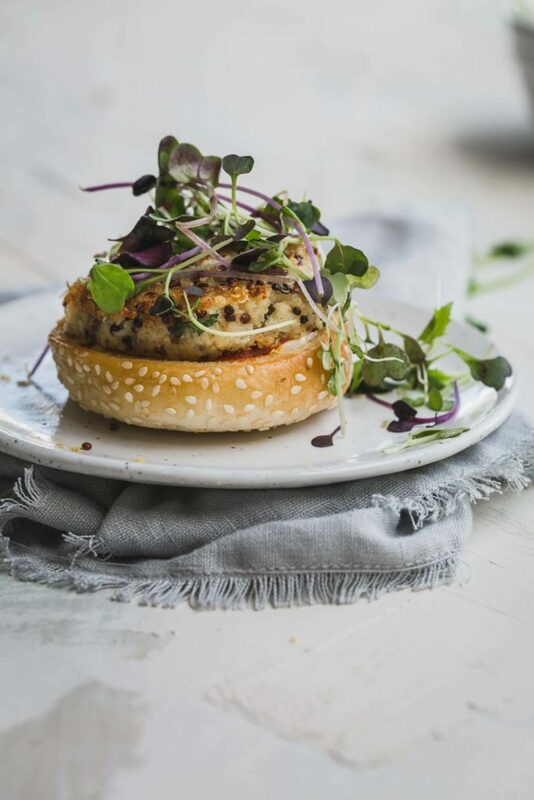 My crispy quinoa cauliflower burger is a little powerhouse of goodness. 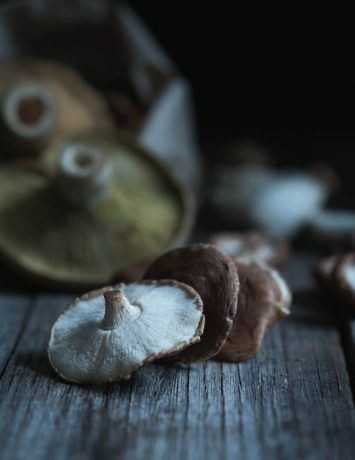 With antioxidant-rich cauliflower and protein packed chickpeas and quinoa these little guys deliver a nutritious punch. Also, they are easy to make and delicious so it’s a win/win. To make them gluten-free, simply use gluten-free breadcrumbs and buns. I hear you. And yes, these cauliflower burgers are softer in the centre than I usually make but I have a few tricks to overcome vegan burger slippage. I use slider-size buns and make the burger patties palm-size to fit – I find the smaller the burger size the easier to manage slippage. Secondly, the more breadcrumbs you add the firmer the pattie will be; I used a half-cup but you can add more. Also, I always pop my vegan burger patties in the fridge to firm up. It’s a simple solution but it works. Finally, use a soft bun like a vegan brioche. Trying to tear in to a chewy bun like a sourdough will always lead to total slippage and mess. I am pretty chuffed with this crispy quinoa cauliflower burger recipe. 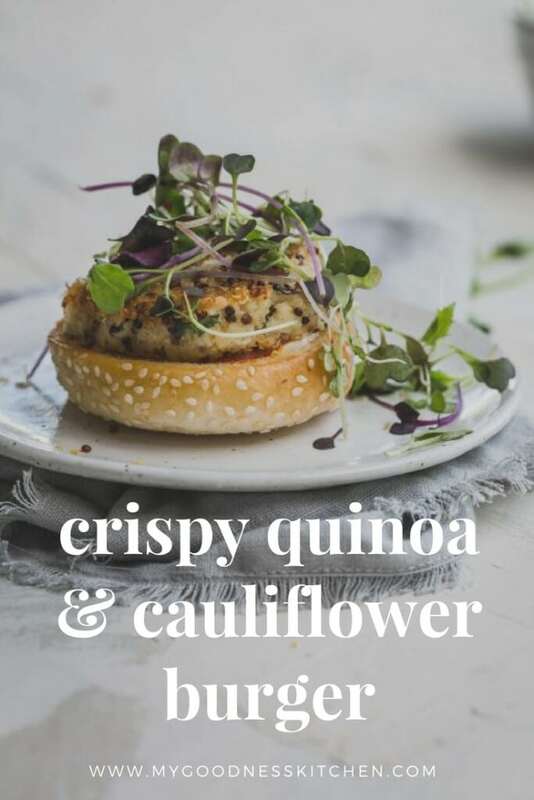 Nutty toasted quinoa and roast cauliflower with fresh coriander leaves and vegan parmesan come together in a moorish bite while lemon infused fresh greens add freshness. I enjoy the heat of the sriracha mayonnaise while my Elf prefers plain mayonnaise. It’s a simple solution to make these vegan burgers kid-friendly. NB: one raw cup of quinoa will yield more than enough cooked quinoa for this recipe. 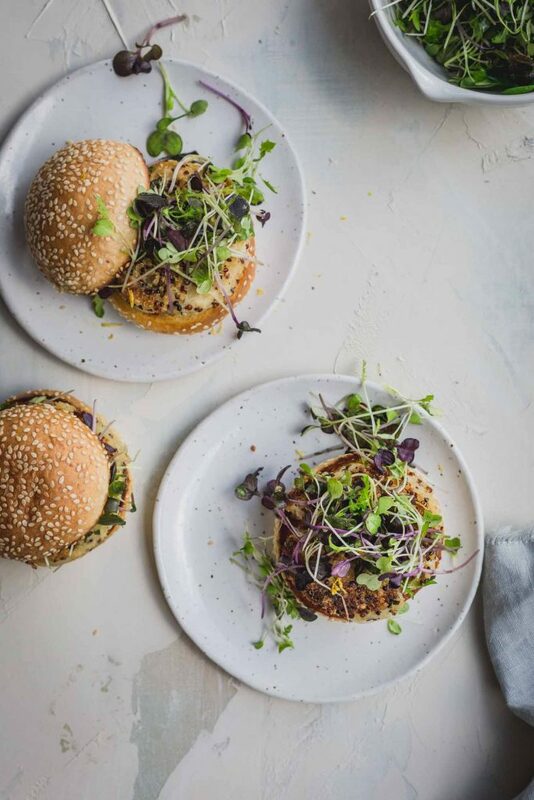 This Crispy Quinoa Cauliflower Burger is a vegan burger packed with protein and loaded with tasty cauliflower and vegan parmesan. Preheat the oven to 180 degrees C (356 degrees F) and cut the cauliflower in to florets before placing them in a roasting pan. Drizzle with the olive oil and season well with sea salt. Roast in the oven for 15-20 minutes and remove to cool. When cooled, chop half the cauliflower in to small chunks and place the other half in a food processor with a half-cup of the cooked quinoa, the full cup of chickpeas and the coriander. Add the aquafaba and pulse the processor until the chickpeas are smooth and holding the mixture together. Transfer the mixture to a large bowl and add the remaining cauliflower, another half-cup of quinoa, the parmesan, sea salt and breadcrumbs and stir together. Using your clean hands, test that the mixture comes together in to a patty. Add more breadcrumbs if necessary. Line a tray with grease proof paper and add the last half-cup of cooked quinoa to a plate. Form the burger mixture in to small palm sized patties and gently press them in to the quinoa (you can press the quinoa in to the patties if that's easier) before laying the burgers on the lined tray. When all burgers are ready, place the tray in the fridge. To dress the micro-herbs, place them in a bowl with the lemon zest and a pinch of sea salt. For the sriracha mayonnaise, combine the vegan mayonnaise and sriracha sauce to taste in a small bowl. Cut the burger buns in half and lightly brush the cut side with oil for toasting. Heat a large skillet over medium heat and add a tablespoon of sunflower oil. Take the burgers from the fridge and add them in batches of three or four to the hot pan. Cook for three minutes or until a crisp seal forms on the bottom of the burger. Turn the heat down slightly and cook for another minute. Gently flip the burger and cook the other side for another three minutes. Repeat with the remaining patties. While the burgers are cooking, heat another pan on low to medium heat and gently toast the burger burger bun, cut side down. Remove from the heat and add a good dollop of sriracha mayonnaise to the bun base and top with a burger pattie. 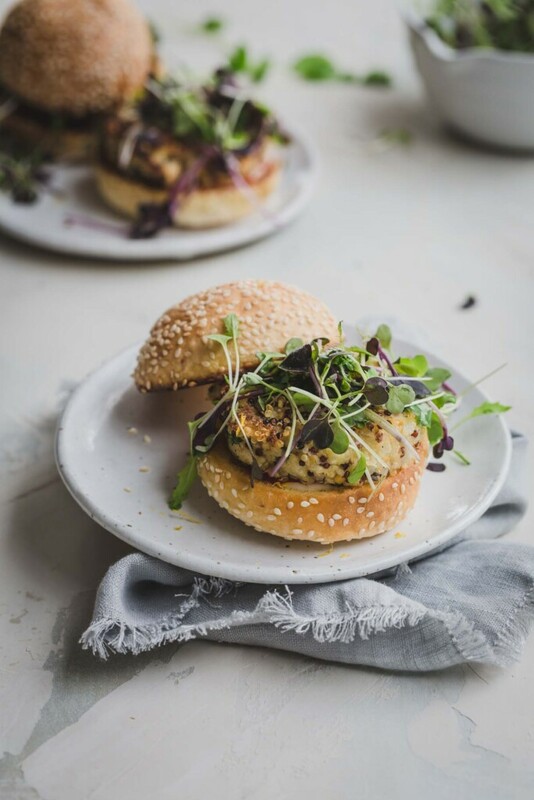 Dress the micro herbs with a drizzle of olive oil and place a handful on top of the burger. Finish with the bun top to serve. Repeat with the remaining burgers. One raw cup of quinoa will yield more than enough cooked quinoa for this recipe. Thanks for your quick reply. Now I can make these for supper! There’s “3 T sunflower” in the ingredient list but I don’t see it anywhere in the preparation of the recipe. Is this sunflower seeds? Sunflower oil? Where to add this ingredient? Arghhhh, Autumn I am so sorry. It’s sunflower oil and I’ve added it to the ingredient list. It’s for frying the burgers in batches. My apologies. Made this for lunch yesterday. So good! Thanks for the recipe. Thanks Baxter. I am so happy you liked it. I just checked out your site…very cool.